Kingdom Come: Deliverance developer Warhorse Studios is obsessed with realism. 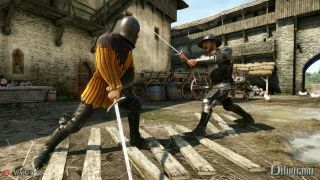 They spoke about combat more than a year ago, but this new update goes into more detail on how the team is designing the system to create duels that are authentic, but readable from a first-person perspective. When the developers realised that realistic combat would involve thousands of animations, they created a system that uses procedural animations. Each weapon has two basic attacks to different parts of the body, and you can chain moves together for special techniques. Apparently, characters have 36 zones that you can hit, though the earlier video stated six so I'm guessing each has six sub-zones. In the video you can see what looks like a five-directional target, which makes for an interesting comparison with For Honor's three-directional system. The story of how Warhorse created their combat system is interesting, but despite all their interest in realism it is, at the end of the day, an RPG. It'll be interesting to how skill points will affect the ebb and flow of your attacks when the game comes out next year.